These tasty side potatoes were an after thought when we realized we did not make enough food for everyone coming over. 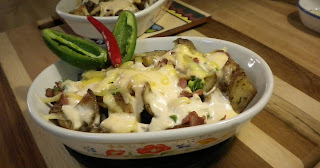 I took some of Zo's tossed and roasted potatoes she made the night before and fancied them up a bit for company. These Spicy Yummy Tossed Potatoes actually ended up stealing the show because they were so delicious looking and tasting. Just goes to show you that days of planning can be beat by 20 minutes of panicking, Enjoy! Separate the potatoes evenly into 4 small baking safe plats. Sprinkle with roast beef, jalapeno and Gouda. Drizzle 2 tbsp of yummy sauce over each serving and place bake in the oven until cheese melts (5-7 minutes.) Remove from oven and let set 2-3 minutes before serving hot.